Governor Ricketts is expressing disappointment by the Legislature’s Revenue Committee’s failure to advance his proposed constitutional amendment to limit property tax increases. Ricketts says he doesn’t understand why the committee doesn’t want to give Nebraskans the opportunity to vote on a limit on local spending. If there isn’t legislative action, Governor Ricketts indicate he would be willing to support a petition effort organized by others to put the local spending cap on the ballot. 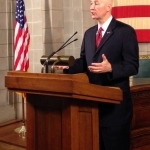 Governor Ricketts says proposals expected from the revenue committee next week don’t offer really tax relief. But will instead have winners and losers….raising taxes for some Nebraskans in order lower taxes for others.